I was overweight and did not know why I started noticing, with the way my clothes were fitting, I was losing weight! I was very excited but I did not feel very good. I was tired and trying to work. I was shaky and irritable too. I had started having some eye swelling and pain but had no insurance at the time and just used eye drops thinking I was suffering from dry eye. My daughter told me she thought I had Graves' disease because I slept all the time and was losing so much weight. When I started receiving my Medicare in May, I was able to get to 3 doctors who each have a role in my treatment and recovery. I also have lumps on the lower part of my left leg and swelling on both shins. I also had joint pain every day for months before I was diagnosed. My heart raced all of the time as well. It skipped beats and felt as though it was jumping in my chest. I did go to our local emergency one evening about 6 months ago with chest pains and shortness of breath. The tests were normal or so the doctor said. I was afraid of having a stroke because my blood pressure was very high for me. I had a complete thyroid removal surgery yesterday and do feel somewhat better. I will now be taking the thyroid replacement pills starting Friday. I still take the beta blockers but the surgeon told me I may not have to take them much longer. Graves is very serious and can cause serious problems, so if you suspect you may have Graves, please try to find a way to get treatment. The surgery is painful and I have had trouble sleeping. My surgery lasted 3 hours and my back hurts! The incision is sensitive but not bad. Use ice regularly to help with swelling and pain. Take pain medicines. Good luck! Following were my symptoms of Graves' disease. I could only swallow liquids. Muscles were too weak and shaky to brush my own hair or walk up and down stairs. I had to crawl up the stairs. Profuse sweating and heat intolerance and the sweat would hurt my skin. My skin hurt to wear clothes. My heart would pound and race for no reason. My eyes bulged out and hurt. I was very skinny with an enormous appetite. Extremely low blood pressure to the point of fainting. Extreme pain in my fingers. It was painful to even turn the pages of a book. Bowel movements three times a day. I couldn't sleep for more than 3 hours at a time, with boundless energy. I felt that it was hard to breathe or to get enough air. People could upset me easily by being mean. And then I would have trouble breathing also. My symptoms of Graves' disease are fast heartbeat, sweating and weight loss. 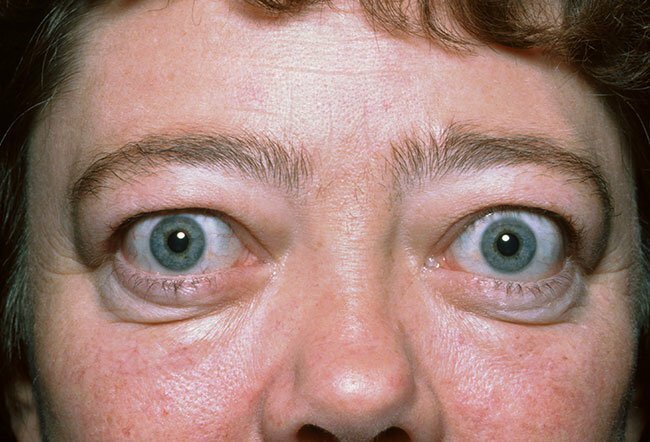 I developed Graves' disease after a robbery at gunpoint. About three weeks after it occurred, I woke up in the morning to have my coffee and found myself shaking and unable to lift the cup or even hold a spoon, the trembling was so bad. After that I started to lose hair and my finger nails became quite deformed. Heart palpitating and sweating soon followed. I was so conscious that I wouldn't leave my home. Once before diagnosis I had a couple shots of whiskey before attending an affair to calm myself and control the tremors. When diagnosed, I was emaciated, had high blood pressure and depression, as well as light and temperature reactions. It got so bad that I wouldn't leave the house, the muscle weakness interfered with climbing the steps, my balance was off and I held on to the rails. If I was carrying a gallon of water I had to put it on each step as I made my way up the steps. The fatigue stopped me in my tracks from working out! I had no energy, and a feeling like I was stuck in quicksand, my legs were so weak, and my core was in very bad shape so much that if I sat on the floor, I couldn't get back up! I attributed this to a fall I had taken. I later found out just what the thyroid controls. Looking back on it I had every single symptom minus the thyroid storm, but was also heading in that direction. The symptoms were tachycardia, trembling, sweating, weight loss, irritability, anxiety, dry skin/hair/nails, trouble swallowing and heat sensitivity. I've been on treatment with methimazole, and it does help, but I am all over the map with how I respond. I either go hypo, or bounce around the map on the hyper side. I have a lot of muscle and joint pain, kind of like I have the flu. I also have peripheral neuropathy although it's not terrible. I just was diagnosed with Graves' disease. The pills for my pounding heart are working, but the Tapazole is making me so dizzy!